Combining double stacker efficiency with long distance capacity, this new truck is your flexible partner – all the way through the warehouse. 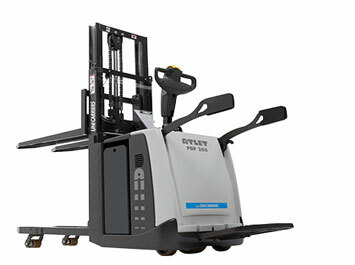 The new PDP 200 is perfectly suited to cross docking operations including loading/unloading, internal transportation and double stacking. Standing safely on the platform, the operator conveniently handles two pallets per work cycle. Ensuring superior ergonomics and efficiency, the truck features a ProVision mast design as well as traction and safety enhancing technologies such as a hydraulic Friction Force system and an Anti-Rollback function. Allowing for long travel distances and extended work cycles, the folding operator platform has excellent damping, while the operator is protected by foldable protection bars. A number of fixed platforms are available as options. The low chassis prevents foot injuries, and the compact design together with power steering fixed (optional) facilitates manoeuvring in tight spaces. Lifting 1000 kg up to a height of 2090 mm, UniCarriers’s ProVision mast design with off-centre lift cylinder optimises vision and operational efficiency. The newly developed lift cylinder contributes to superior lifting and lowering performance. Hydraulic system that increases drive-wheel pressure in relation to load. This ensures optimised traction in all conditions. AC drive motor with Anti-Rollback function ensures safe handling on dock levellers. The tiller is ergonomically designed to ensure that all controls are correctly positioned for comfortable handling in all situations. Adjustable in length, it allows all operators to find their ideal driving position. Servo steering (optional) contributes even more to operator comfort, and the electrical proportional valve controlled by a rocker switch on the tiller head further improves handling when lifting and lowering.